(a) Check the radio automatic station search function. (1) Check the radio automatic station search function by activating it. (a) Check if any optional components that may decrease reception capacity, such as sunshade film or a telephone antenna, are installed. Do not remove optional components without the permission of the customer. (1) Remove the antenna connector from the radio and display receiver assembly. 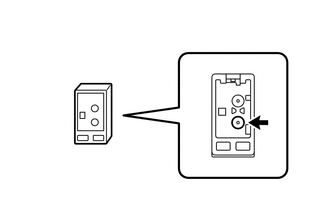 (1) Turn the ignition switch to ACC with the radio and display receiver assembly connector connected. (2) Turn the radio on and tune into AM mode. (3) Place a screwdriver, thin wire or other metal object on the radio and display receiver assembly antenna jack and check that noise can be heard from the speakers. Noise can be heard from the speakers. (a) Replace the antenna cord sub-assembly and check if radio broadcasts can be received normally (See page ). 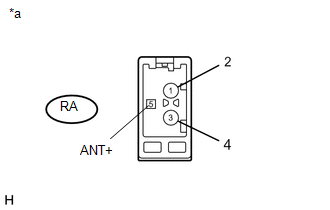 (a) Replace the antenna assembly with holder and check if radio broadcasts can be received normally (See page ).